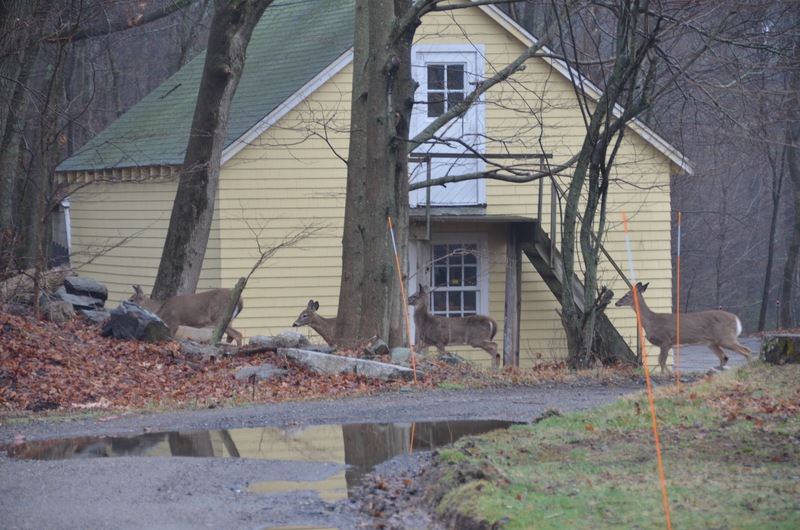 Posted on April 5, 2016 by Sean K.
Over the past few weeks, the sanctuary has been bursting with life as spring is “just around the corner”, even though we woke up to snow on April 5th. Join us at 8am on our weekly Friday bird and natural history hikes to see all the amazing creatures, plants, and views on the Morse Wildlife Sanctuary. Even better is the terrific company and being out in nature. While I was investigating life in a vernal pool, some peaceful fur way way up in the crook of a tree caught my attention. 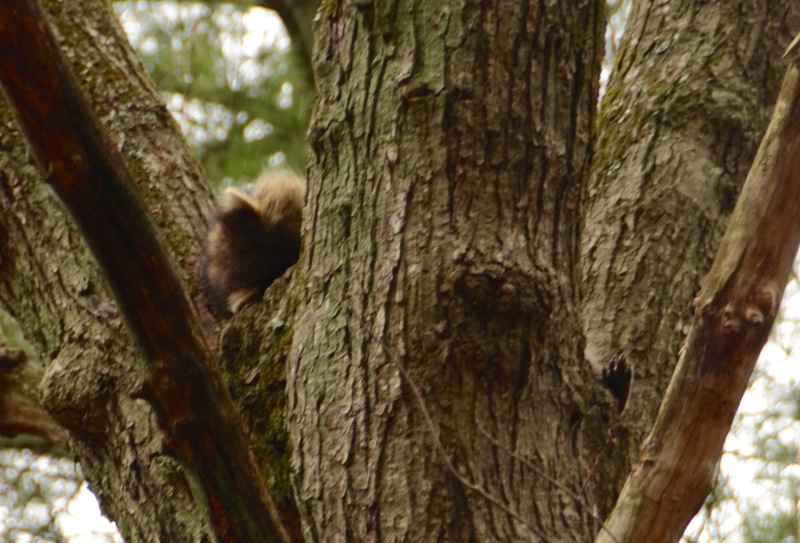 A raccoon was snoozing the day away. Check out the ears on one side and the foot on the other. Near one of our smaller vernal pools, the damage to this tree puzzled me. Based on it’s teeth marks, it is clearly a rodent, but the damage is one inch deep at some points and is about 8 ft long. I’m are not sure what caused this damage, but could it be a porcupine? Let us know what you think. Here are a few of the birds that have been seen over the past few weeks. Our digital photography homeschool class observed a cooper’s hawk preying on a mallard. Stunk cabbage is one of the first plants to emerge in the spring. It is found near soggy or submerged soil and is usually pollinated by flies. This was taken near the Pequit Brook. Check out this amazing little orchid hiding under the pine needles. These pictures are from early March. We have had over 10,000 of these flowers blooming in bare patches of soil and on our lawns. They are so easy to miss until you start looking for them. In early March, when the weather cracked 60 degrees, the spring peepers and wood frogs started calling. Wood frogs sound more like ducks than frogs. Check out these two videos to hear them. Wood frogs are abundant at our wildlife sanctuary and are always one of the first frogs to emerge from hibernation. This year, wood frogs were first observed on March 10 congregrating in large numbers at our main vernal pool and where I counted well over 60 wood frogs on March 11. Listen to their chorus from March 11, 2016. Spotted salamanders have also been laying eggs and fairy shrimp are abundant. On April 3rd, Owen Cunningham and a volunteer spent the afternoon searching for life in our pools and were able to identify wood frog and spotted salamander eggs. This data will be submitted to the state and we expect that our vernal pools will be certified by the Mass Natural Heritage and Endangered Species Program. This entry was posted in Education, Natural History, News, Wildlife Sanctuary and tagged American robin, brown creeper, Canton, chickadee, cooper's hawk, dark-eyed junco, Eastern Phoebe, fairy shrimp, friday nature walk, Hairy woodpecker, hermit thrush, hike, ma, Mass Audubon, morse sanctuary, Natural History, porcupine damage, raccoon, raccoon snoozing, rattlesnake plantain, red-shouldered hawk, Red-tailed hawk, red-winged blackbird, tufted titmouse, vernal pool, walk, white-tailed deer, Wood duck, wood frog on April 5, 2016 by Sean K..